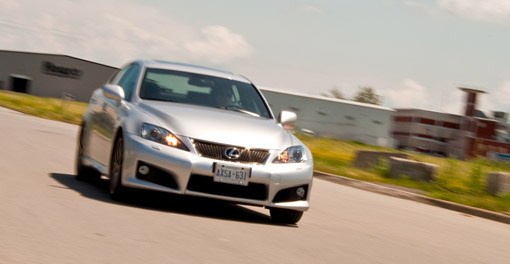 As the story goes: the Lexus IS-F began as a secret project by Lexus chief designer Yukihiko Yaguchi, who wanted to build a Lexus that could rival Europe’s top sports sedans. Yaguchi, who also worked on the last Toyota Supra and the first generation LS 400, saw a unique opportunity to extend the Lexus brand with premium, powerful variants of the existing lineup, similar to the Mercedes’ AMG or BMW’s M divisions. 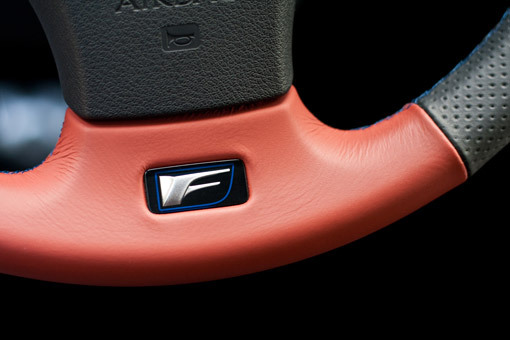 The “F” division, as it’s now called, focuses on performance, and the IS-F is the first example of this new direction. Starting with a standard IS, this premium sports sedan packs a 5.0L V8 pushing out over 400 hp, features a braking system by Brembo, and is a blast of pure velocity. But is it still a Lexus underneath all that speed? Designed by BBS to resemble samurai swords, each IS-F wheel is made of forged aluminum and can only be placed in one position due to different left & right rim patterns and front & rear wheels sizes. This may prevent tire rotation, but the look is beyond compare. Quite possibly my favorite wheels ever. Terracotta & black leather with bright blue stitching is a color combination I read about but never expected to see, but it didn’t take long for the garishness to grow on me, for the simple reason that it balanced out the plain silver exterior. Add in the carbon fiber accent inserts, and the IS-F sports the loudest interior I’ve ever seen in a Lexus. While most of the actual cabin design is straight from the standard IS, there are some real driver improvements. 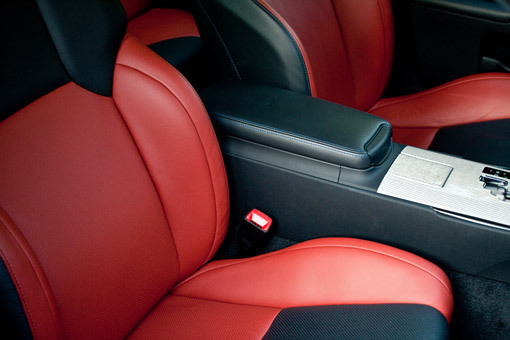 The front seats feature improved side bolsters on both the seat and seat-back, which helps to absorb the IS-F’s increased ride harshness along with providing more support in the corners. The rear seats remain a snug fit, and may be the only real complaint with the IS interior design. This particular IS-F was not optioned with the Navigation package, which I didn’t miss all that much. After all, getting lost means more time driving, right? However, I did find myself wishing for the backup camera, which would have made in-city driving much, much easier. What I found with the manual shifting was a tendency for extreme speed, so I spent quite a bit of time in automatic mode to keep myself under control. And it wasn’t just the obscene amounts of horsepower — with its low center of gravity and solid, predicable balance in the corners, the IS-F performs as though on rails, locked on course. Engaging the Sports mode had the transmission holding gears longer and added an extra edge in the handling. As for disengaging the Traction Control, well, let’s just say the local mall parking lot may never be the same. 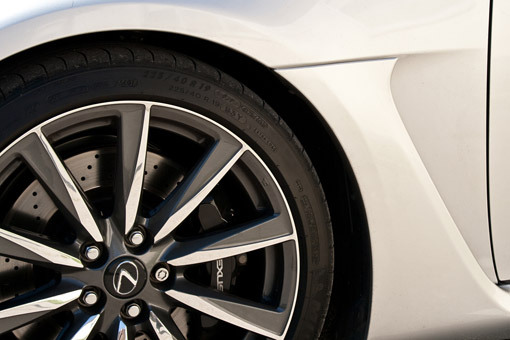 For all its power, the IS-F is complimented nicely by the braking system that Lexus co-developed with Brembo. The 14.1” rotors and six piston calipers in the front and 13.6” rotors and two piston calipers in the back are simply without par in my personal experience, and brought a ton of confidence in pushing the sedan to just beyond my comfort zone. In fact, it didn’t take too long for the IS-F to totally obliterate my usual driving habits. Suddenly, every time behind the wheel felt like a race to the finish, every stop light was a countdown, and it was all in pursuit of one thing: 3,600 rpm. 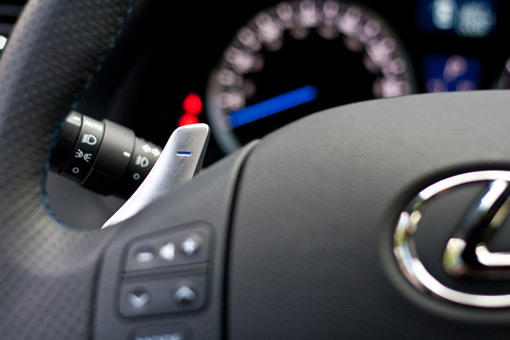 It’s at that point on the tachometer that a secondary inlet opens in the air intake system and the engine sound jumps from a low growl to a monstrous roar, and hitting that note becomes the sole reason for driving. It’s that addictive. I will admit in all honesty: driving the IS-F was the most fun I’ve ever had behind the wheel of a car. The handling was near-telepathic, and I have never experienced such immense, instantaneous speed. But all this intensity is both a gift and a curse — there’s just no way to do anything slow in the IS-F. Beyond the torture of having to cage the power, low speed driving has a tendency to be jarring, no matter how smooth the road. While this harshness does even out at 70 km/h (40 mph), there are times when the IS-F feels like a wooden rollercoaster. But the question remains — is the IS-F still a Lexus? Well, there were times when the suspension felt just too stiff, and the car has a difficult time getting comfortable in stop-and-go city traffic. 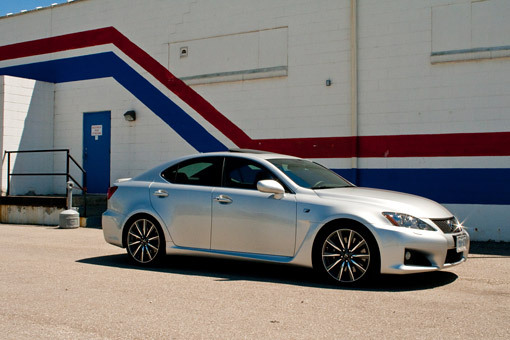 But it isn’t a soft ride that defines a Lexus, it’s the pursuit of perfection. And when you consider that this is a first-generation vehicle capable of going head-to-head with the very best in its class, it becomes a very familiar story. After all, the quintessential Lexus, the original LS 400, did the very same thing 20 years ago. Special thanks to Lexus Canada for providing me with this review vehicle.